On Wednesday, I wrote about the brands that scored in the top 10 on the value of patriotism in a study by Brand Keys, a research consultancy. Louisville Slugger did not make the top 10, but was ranked in the top 20. I was a Little League baseball player as a young boy. To me, Louisville Slugger was a brand of baseball bat for which there was no substitute. I would never think of stepping into the batters box without my favorite Louisville Slugger Bat. My favorite baseball player Mickey Mantle used a Louisville Slugger bat. Thinking back on it, this was my first experience with brand loyalty. Louisville Slugger was founded by John A. “Bud” Hillerich in 1884. John’s father owned a woodworking shop in Louisville, Kentucky. Legend has it that Bud who played baseball himself, took an afternoon off to watch the Louisville Eclipse play. The team’s star, Peter Browning, mired in a hitting slump, broke his bat. Bud invited Browning over to his father’s shop to make him a new one. With Browning giving him advice, Bud hand-crafted a new bat from a long slab of wood. Browning got three hits with it the next day. Word of mouth spread quickly and soon ball players were showing at the shop looking to have bats made. In 1894, the Louisville Slugger was registered in the United States Patent Office. In the early 1900s, Louisville Slugger pioneered a sports marketing concept by paying Hall of Fame hitter Honus Wagner to use his name on a bat. By 1923, Louisville Slugger was selling more bats than any other bat maker in the country. Baseball was the nation’s most popular sport, and legends like Babe Ruth, Ty Cobb and Lou Gehrig all swung Louisville Sluggers. Louisville Slugger has sold well over 100,000,000 bats since it was founded in 1884. Today, 60% of major league baseball players use a Louisville Slugger. Louisville Slugger has been a baseball legend for nearly 130 years. It is an American icon. The brand has been used by World Series Champions, Olympians and All Americans. Louisville Slugger is an American original. Louisville Slugger is at the heart of the game. It is the crack of the bat. The brand has seen more World Series Champions that any brand on the planet. The brand is connected to legendary players and historic baseball events. 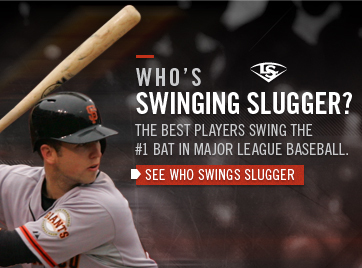 I love the tagline from their current advertising, Louisville Slugger “Leave Your Mark”. For me, the brand is connected to some of my best memories growing up, playing baseball with my older brother and father. Did you use a Louisville Slugger Bat when you played baseball growing up?